WOONSOCKET, R.I., 2017-Feb-04 — /EPR Retail News/ — CVS Health (NYSE: CVS), the nation’s largest pharmacy innovation company, today (Feb. 1, 2017) announced a major commitment in support of women’s heart health. As a new national sponsor of the American Heart Association’s Go Red For Women movement, CVS Health has pledged to raise a minimum of $10 million over the next three years to support life-saving cardiovascular research and education. Helena Foulkes, President of CVS Pharmacy, has also been named as the inaugural National Chair for Go Red For Women, an annual campaign designed to raise awareness of heart disease and stroke as the number one killer of women and to empower women to take charge of their heart health. Cardiovascular diseases cause nearly one in three deaths in women each year or one death every 80 seconds. It is important to be armed with heart health knowledge, including knowing the five key numbers that affect risk for heart disease total cholesterol, HDL (good) cholesterol, blood pressure, blood sugar and body mass index. To help address this need, MinuteClinic the retail walk-in medical clinic of CVS Health is offering free “Know Your Numbers” heart screenings at its more than 1,100 locations nationwide on February 14, Valentine’s Day. For a list of MinuteClinic locations, visit http://www.cvs.com/minuteclinic/clinic-locator. No appointment is necessary; screenings will be provided on a first-come, first-served basis. Go Red For Women is the American Heart Association’s national movement to end heart disease and stroke in women. Cardiovascular diseases in the U.S. kill approximately one woman every 80 seconds. The good news is that 80 percent of cardiac events may be prevented with education and lifestyle changes. Go Red For Women advocates for more research and swifter action for women’s heart health. The American Heart Association’s Go Red For Women movement is nationally sponsored by Macy’s and CVS Health, with additional support from our cause supporters. 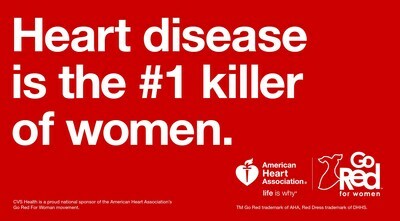 For more information, please visit GoRedForWomen.org or call 1-888-MY-HEART (1-888-694-3278).  This entry was posted in Business, Financial, Healthcare, Management, Philanthropy, Retail, Retailer and tagged Al Royse, American Heart Association's, Angela Patterson, CVS Health, Go Red For Women movement, Helena Foulkes, national sponsor. Bookmark the permalink.